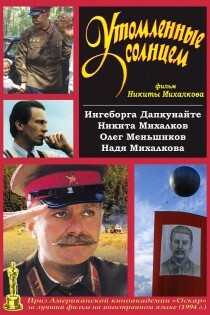 Russian star Nikita Mikhalkov writes, directs and takes top bill in this masterful drama set in the mid-30s in Stalin’s Soviet Union. Burnt by the Sun follows an eventful day in the lives of Red Army division commander Kotov, on leave at home, and his wonderful and somewhat eccentric family. What transpires on this extraordinary day will run many different emotions through your veins and leave you a more educated human being. Excellent acting by a formidable cast brings the formidable storytelling to life in this beautifully made film. Burnt by the Sun won many international awards including the 67th Academy Award for Best Foreign Language Film. Reading any more information on this film before you have watched it will deprive you of many of the subtle changes in emotion you would otherwise enjoy. However, I recommend you do read up on the main theme after you have seen the film – it is very interesting. You can find more information on Wikipedia and IMDb. This little girls is Nikita Mikhalkov’s real daughter. This is an outstanding heartbreaking movie. I looked for a You Tube version a while back. nada. Do you speak Russian? I was able to find it here: https://www.youtube.com/watch?v=k7nOE-OKQvU … however, there are no subtitles. Amazon also has some options available for purchase. I really want you to see this movie! It is indeed outstanding and heartbreaking. I think this my favourite movie of all time. After being a pro-Soviet communist for my first 30 years this film came as a gut wrenching collision of the most extreme. I have watched it so many times and it never fails to move me to tears. Burnt by the Sun explored the different motivations behind those who supported the Revolution, and how the idealists got trampled by the men who wanted revolution for themselves and a new subjugation for the rest. Scott Walker saw the ghost of Stalin walk the streets of Czechoslovakia in 1968. I never watch Russian movies. Thanks for the tip! Watch more Cindy, they are usually worth the effort. Start with ‘Come and See’, and you won’t look back! best wishes, Pete. Oh, I need to see that one too! Seconding the recommendation. It’s very good. Great movie. And you’re right, the trailer doesn’t represent it very well. I absolutely love this film. My family has watched this at least 5 times since its release (we still have the original VHS version). Very touching, moving, and disturbing. Unnerving how the Soviet machine reached into every life and disrupted the fabric of families for its own survival. Great to see this marvellous film included here. Every time I watch it, I enjoy it even more. Wonderful photography, and a totally believable cast. Hi Pete – lovely to hear from you! I hope your thoroughly enjoying retirement in Beetley. Burnt by the Sun is a wonderful film. It’s my father’s all-time favourite alongside Some Like it Hot!